was very familiar. 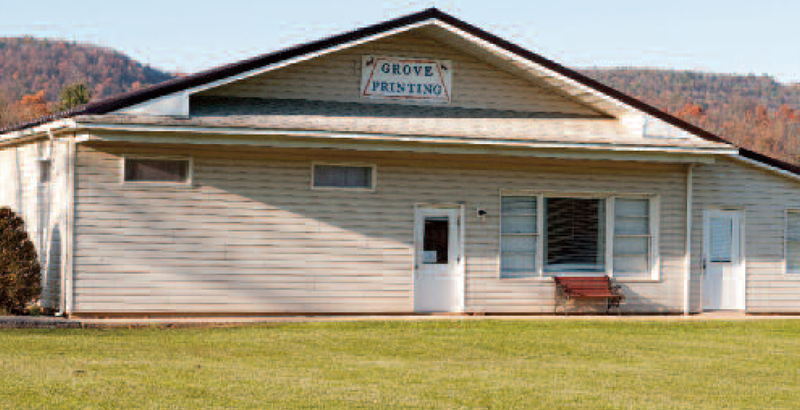 After some brief negotiations, the press was purchased and moved into the basement of the family home and Grove Printing was established with Howard and Shirley Grove as owners. Grove Printing was operated on a part-time basis until 1970 when Howard quit his job at HRB and ran the printing business full-time. With the print shop in the basement of their house, all family members became involved, Deb, Howard Jr., and Duane would collate and do small jobs until old enough to run equipment. In 1974, the current shop was built on a lot bordering the family home. Grove Printing still operates out of the same building today. Grove Printing Incorporated in January 1, 2011 with Howard Grove, Jr. as President, Debra Greene as Vice President, Shirley Grove as Secretary and Duane Grove as Treasurer. Combining state of the art technology with tried and true printing equipment, Grove Printing specializes in offset and digital printing, wide format, laminating and bindery work. Our goal is to service our customers with the best possible product in a timely manner at a fair price.